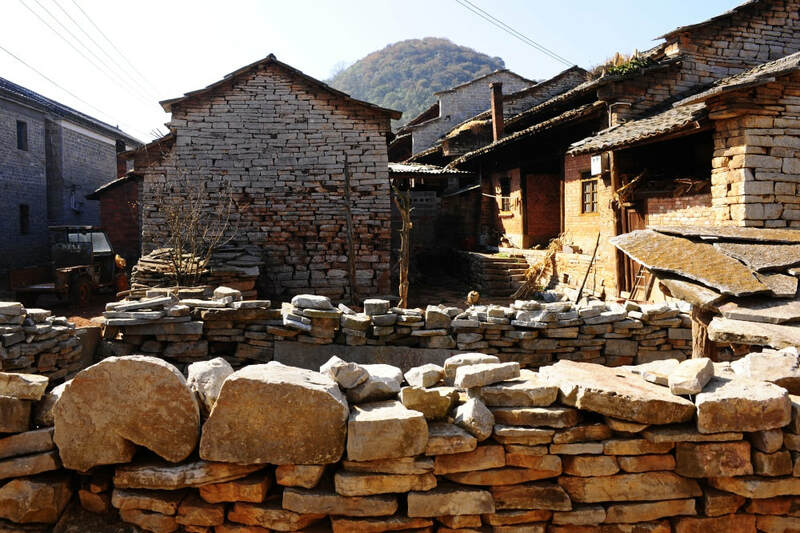 Located around 120 kilometers southeast of Kunming, Danuohei Village offers many stone houses to explore. The houses are built with bluestones but without any steel or cement. With dark and light colors, they are stacked on top of each other. These stones have experienced a long history, witnessing the changes of the Sani people’s life. Situated some 41 kilometers from Stone Forest, Danuohe Village originally built in 1816 is home to Yi people for hundreds of years. The slabstone road winds through the whole village. You will find the old trees in the courtyard of most of the houses in the village. When the villagers are free or when it is during the local festivals, they will wear the Yi costume and dance the traditional Sani Dance. If interested, you could visit the Folklore Museum in the village. At the museum, you will find the old production tools, and daily necessities, tools and some artifacts used by the ancestors of Sani, such as woven straw hats, the exquisite cloth bags, etc. Villagers live a simple and unchanged life as before. Some artists create their works at the village from time to time. If interested, you could try the Banquet of the King Yi. All the villagers can speak Yi language. Mizhi Festival is the most important festival in the village. It is the sacrificial festival when the Sani people pray for the good conditions for themselves and the livestock and they hope they could get a good harvest of the grain. During the daytime, they do the sacred activities. When the moon rises, they return back to the village, shouting “Hagou, Hagou”. On the way back, they will constantly condemns those who have violated the law, morality, and done bad things. The festival is always held in the lunar November. If you would like to experience the local life more, you could stay overnight at one of several inns at the village. You could visit several local houses as well. If you are interested to visit the village for photography purposes, the best time to visit Danuohei Village is during the sunset. The best months to visit are from April to November. Only one coach passes by the village. The route is from Shilin East Bus Station (石林东站) to Haiyi (海邑). Please remember to tell the driver that you will be dropping off at the Nuohei Village (糯黑村). After getting off the bus, please walk across the road to the stone which says “石头寨”. Or you could rent a vehicle to the village directly from Shilin County (石林县) or Kunming. As at 21st January 2019, the entrance pricing to the village is free of charge. Please respect the local customs. Please take care of your steps when walking on the slabstone road on rainy days. Interested in visiting Danuoehi Village on a Tour? Wendy Wei Tours offers a variety of different packaged tours as well as custom tours including Danuohei Village, among other attractions and destinations. To find out more, please visit our Tours page or Contact Us directly to find out more.